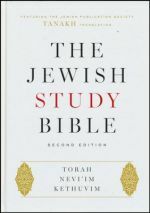 Originally published in 2004, the Second Edition of The Jewish Study Bible (2014) by Marc Zvi Brettle a revised version. I bought this 2,300 pages volume recently to enrich my collection of Bible translations, commentaries and Study bibles. As reference, the Jewish Publication Society translation of the Hebrew Tanakh (among Christians known as First or Old Testament) is used, the latest link in the chain of Jewish Bible Translations. It was made directly from the traditional Hebrew text into the idiom of modern English, searching for the meaning of words and phrases. That contrasts the close, literal method of Bible translation applied in the Greek Septuagint, and Targums, which were foundational and influential for translations like the Latin Vulgate (4th Century CE), and English King James Version (1611). The latter was used as source for e.g. Revised Version (1881-1885), and the American Standard Version (1901, revised in 1952). This treasury for lay readers has the full Tanakh: Torah, Nevi’im, and Kethuvim, Law, Prophets, and Writings, with introductions to each book, footnotes and comments along the running text. True to Jewish tradition 42 essays are included on a plethora of themes categorized in Jewish interpretation of the Bible, Biblical ideas and institutions, and the Bible in Jewish life. Backgrounds for reading the Bible include history, geography, biblical languages, but also textual criticism, canonization of the Bible, and development of the Masoretic Bible. Only one essay is dedicated to the use of the Tanakh in de New Testament and one on use and exegesis in the Qur’an and Muslim Tradition. It’s important to understand that the notes, commentaries and essays reflect a Jewish point of view. It certainly can help Christian readers to re-think their – often exclusive – own interpretation. On the other hand this volume will not invite readers of the Tanakh to (re-)read the Jewish authors of New Testament gospels, letters and revelations. Marc Brettler is the Bernice and Morton Lerner Chair of Judaic Studies at Duke University’s Center for Jewish Studies. From 1986 to 2015, he taught Near Eastern and Judaic Studies at Brandeis University and since 2001 was the Dora Golding Professor of Biblical Studies. His academic research has been wide ranging. He has explored the use of religious metaphors in the Hebrew Bible (God Is King: Understanding an Israelite Metaphor, 1989), the nature of biblical historical texts as “literary” texts (The Creation of History in Ancient Israel, 1995), and gender and the Bible. He was a co-editor of The Jewish Annotated New Testament (2011) and The New Oxford Annotated Bible (2001 and 2010), the co-author of The Bible and the Believer (2012), the author of Biblical Hebrew for Students of Modern Hebrew (2002) and the co-editor of first edition of The Jewish Study Bible (2004), which was awarded a National Jewish Book Award. His book How to Read the Bible (2005) was published by the Jewish Publication Society and in paperback as How to Read the Jewish Bible (2007) by Oxford University Press.